Adrian Brewer (1891-1956) was born in St. Paul, Minnesota. 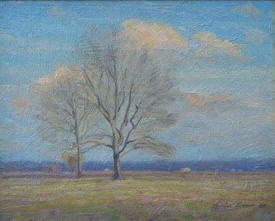 Throughout his life, he was influenced by his father Nicholas Brewer who was a portrait and landscape artist. 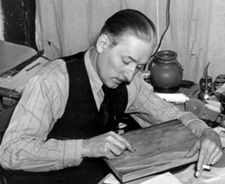 Brewer studied at the University of Minnesota; Art Institute of St. Paul and the Art Students League in New York City. Later he enrolled at the Art Institute of Chicago and in 1920, was elected a member of the Palette and Chisel Club of Chicago. 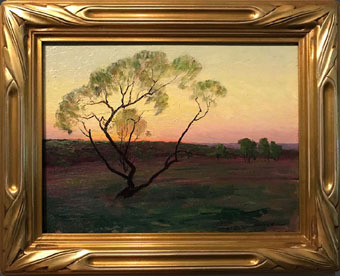 He painted in the plein-air style, which he is mostly known for his landscapes through the South especially Texas and Arkansas and occasionally in New Mexico and Arizona. in 1928 he won the prestigious Edgar B. Davis wildflower contest with a bluebonnet painting. Adrian Brewer was a member of the Salmagundi Club of New York; American Federation of Art; Artists Guild; Chicago Society of Artists and more.